This pattern uses a 2.5 mm hook and light pink, dark pink and grey 8 ply wool. You also need grey 4 ply (I didn’t have any 4 ply so I just separated some 8 ply out, the point is it should be a bit thinner than 8 ply). The finished galah is about 10 cm tall, including the tail. 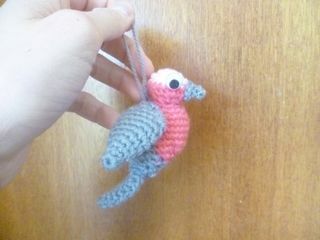 You can add a wool hanger to make it into a Christmas decoration. The pattern is written in American crochet notation. Round 17: decrease until the hole closes. Fasten off, weave in the end. Sew the wings and tail onto the body. 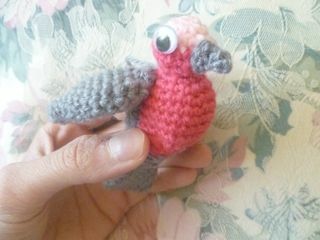 Sew some googly eyes and beak onto the head. 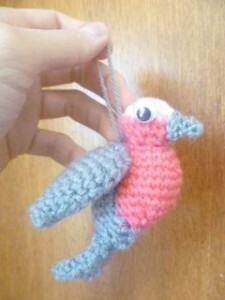 Sew a loop of wool for hanging onto the back.